Have you been meaning to declutter your home? The holidays are coming and I bet stress is already creeping slowly back into your life reminding you of the money to spend and family to prepare for. I recently wrote about reducing your plastics and slowing down a bit. I mentioned Brooke McAlary’s book “Slow: Simple Living for a Frantic World” and how it’s one of the main reasons I’ve finally taken the step to slowing down and wanting to declutter my life, mind, and home. For me, it was relatively easy getting rid of my things. I grew up in a house with a whole lotta’ stuff and always promised myself I wouldn’t overindulge in “things”. Well, as we all know, that can be easier said than done. I don’t have children yet but I hope to within the next 5 years. I’m not sure how it happened, but somehow after three years of living in our house my husband and I had acquired a world’s load of “stuff”. I suspected after a while it was becoming the root of my anxiety. I found an article by the Huffingpost giving 12 Surprising Ways Clutter Is Ruining Your Life and it was quite uncomfortable how accurate almost all the 12 points were! We often have around 10-11 family members come into town for Christmas. We live in a comfortable 2 bedroom, 2 bathroom home which is more than enough room for Emerson and I. When there you add 10-11 people to that equation, life gets a little harder. 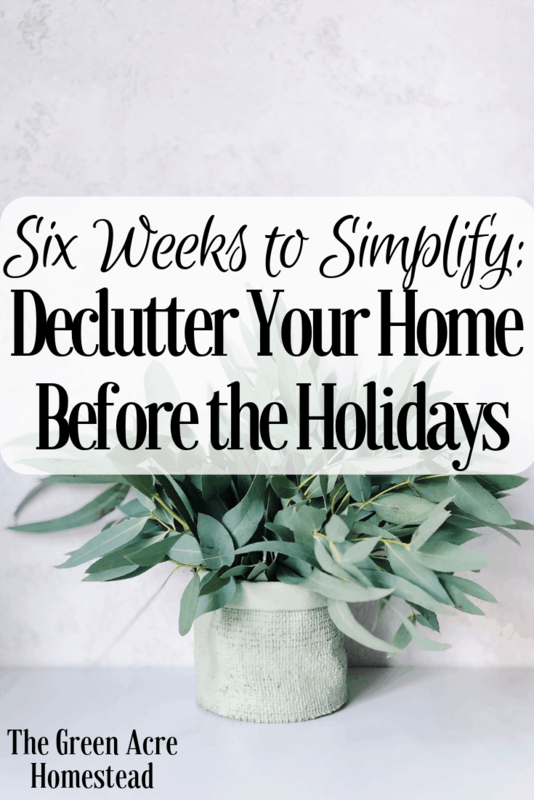 I want to help you declutter and simplify your world in 6 weeks before the holidays hit in full force. It IS doable! If you start today (9/17/2018) and take only 6-weeks, you’ll be done three weeks before Thanksgiving. If your house is ginormous and filled with things, of course, you can take advantage of those few extra weeks and vice versa. Here’s how I decluttered my home. Most importantly, patience and the desire to actually declutter your home and spaces. Once you put an item in the box, it doesn’t leave the box. This is optional but take before and after pictures of the spaces you clear. I wish I would’ve done this because it would’ve helped with motivation. My first task in trying to declutter my home was to start in my kitchen. I’m in my kitchen the most and truly love kitchen gadgets (I got that from my mama!). My older sister and her husband have almost nothing on their kitchen counters and after visiting them this summer, I envied it. I had almost no space at all on my counters and last Christmas it made my life into what I would think Hell might be. Okay, so that’s an exaggeration but it ended with voices a-shoutin’ and tears a-rollin’…not a pretty sight during the holidays! It wasn’t my proudest moment in life. So this holiday season, I decided I wanted all the counter space I could get. I wanted to declutter my home and I needed to start with this kitchen! Remove the items from your counter that you don’t use often. For me, this was my big food saver machine and multiple fruit baskets that rarely had fruit in them. For now, just set those items aside on your kitchen table and we’ll come back to them. Let’s start on your cabinets! I can’t tell you how much stuff I had crammed in my cabinets that I never used. Broken mugs? Trash them or donate them. 6 spatulas? You only need maybe two or three. Stack your Tupperware neatly and you’ll free up more space than you’ll believe. I also got rid of some margaritas shakers I’ve literally NEVER used, cake pans I didn’t know were there, and some much more. Put them in a box and label it DONATION. Once they go in that box, don’t take them out! And remember, if you gave away the bundt cake pan and then found a bundt cake recipe you’d like to try, you can always borrow one from a friend or family member. Fridge, pantry, and dried goods/spices. I think you’d be surprised at how old some of the items in your kitchen might be! For me, it’s so easy to forget about that jar of jelly or a box of pasta I bought before I started practicing a low-carb lifestyle. Go through these areas and dispose of the old, expired items. After you do that, head over to Clean and Scentsible to check out an awesome post on organizing your fridge with bins and mason jars! This will be my next step in the kitchen on my home! Now that you’ve cleared all that cabinet space, put the big ticket items from earlier in the cabinets! Alright, let’s move on to those cluttered closets. Closets can be a great place to shove things! Opening them later is that reminder to declutter your home (or more of a smack in the face with a basketball). I tackled the closets next because I wasn’t quite ready to go through every bit of the bedrooms. Now, I don’t really mean your clothes closets. I’m more-so referring to your utility closets, storage closets, seasonal decorations, etc. In my hall closet, we had old medications like ibuprofen and such from years ago that we never used. I also got rid of a lot of mini shampoos and mini tubes of toothpaste that weren’t open (donation). I repurposed ripped towels as rags for the house or shed (we don’t use paper napkins). Get a bin or a box and put all the things you didn’t know were there in the box. As before, whatever goes in the box stays in the box. Be strong, you’ve got this! The bathrooms were by far the easiest for me when trying to declutter my home. Not because there was nothing there, but because I don’t get attached to hair products, makeup, etc. Get rid of all those empty bottles, expired tubes of mascara, multiple hair shavers and old razors. Unfortunately, a lot of the bathroom stuff was “trash”. Recycle what you can recycle and move on. It feels so nice being able to let my guests get their own towels under the sink because I know it doesn’t look like an explosion happened anymore. There’s more stuff in there because the large closet also acts as our storage closet. So this room was visited twice (once with the “closets” and once more to declutter in the bedroom stage). I knew I’d be less attached to the stuff in it. I thought if I started with this room and got rid of a large quantity of these, I’d be more ready for my own bedroom! If I didn’t know what it was and hadn’t seen it in a year or more I got rid of it. Workout/sports equipment nobody knew was there, heavy coats from our days in Tennessee, clothes I wore in tenth grade (not sure how those made it, wishful thinking I guess!). I could barely walk in that closet when I started. There was so much space cleared that I was able to move my large filing cabinet into the closet and the large suitcase that was shoved under my bed. I got 75% of the stuff off the floor from clearing the shelves and it looks so much better now, I wish I could declutter that part of my home over and over again because it felt good! The spare bedroom is also my sewing room so I sorted through all of my fabrics and chose what to keep and not. I also added a medium basket to the room where I put two workout yoga mats, my yoga wheels, and foam rollers. I don’t keep particularly nice clothes because, well, I work on a farm and get nasty and sweaty all day. The clothes I do have, though, mean something. I have shirts that were souvenirs from trips or given to me, multiple pairs of pajamas from multiple Christmases, and so many scarves. Most of the shirts I kept unless I had other souvenirs or memorabilia that meant more to me. The pajamas were almost all donated, keeping just my favorite pair…or the pair that still fit. Location, Location, Location! I live in Florida so the scarves just had to go. It was funny because I loved these scarves! A few of them were kept for the random chilly winters here in Florida but only enough to fit in a small space, comfortably out of the way. After I was done weeding through my clothes I counted my shirts and still had around 45-50 shirts That’s ridiculous and I’m almost embarrassed to have told you that. I turned all my hangers around the wrong way. Every time I wear a shirt, I turn the hanger back around to the right way. At the end of the year, whatever hangers are still backward are the shirts I’ll be donating or repurposing. You can use this method in other parts of your home you’re trying to declutter, also. I got rid of old sheets, knick-knacks cluttering the nightstands, shoes, jewelry, purses, more shoes (Lord the shoes in this house) etc. 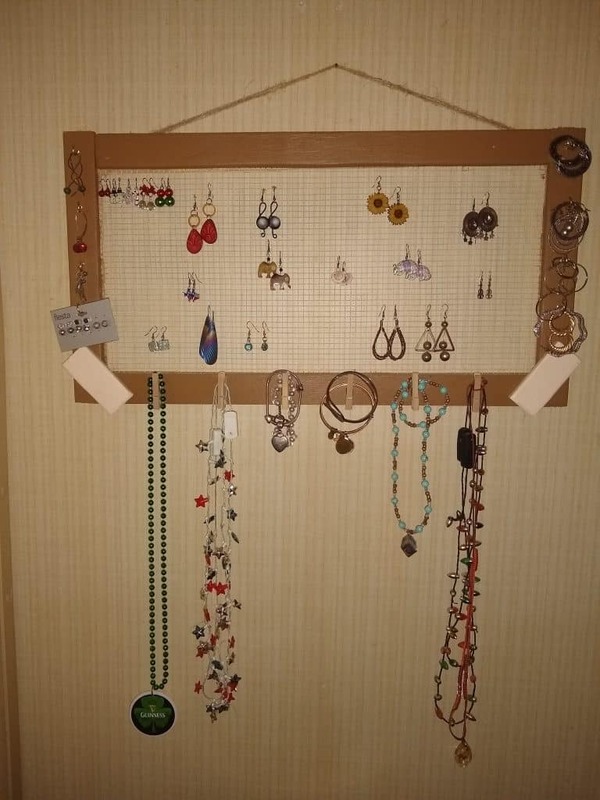 All of my jewelry now fits on a handmade grid rack that hangs on my wall. It looks nice and I use all the jewelry. My advice is to keep what you can see. If you have to dig for it, you might have too many clothes..and I’m speaking from experience here. When you walk in the front door, our living room is the first room see. Unfortunately, it was often the messiest and most in need of a “Declutter Your Home” day. Between this room and my kitchen table, my anxiety was through the roof! I desperately needed a “drop space” for when we came into the door with our wallet/purse. We had shoes all over the place, magazines I’d never looked in, etc. I started with space by the door, sorted through the shoes and donated all of them. I added a basket for our most worn shoes such as flip-flops and a small table I repurposed from another room. That table now has my favorite magazines, a box of tissues, and space for my purse. To the left of the table, there’s another medium sized basket with our most used active gear such as helmets, a yoga mat, a camelback, a frisbee, etc. It all fits into that basket and no more. 2. I bought a second bookshelf because we needed it. We have many books, but I also got rid of many books, too. Now all of our reading books fit on one bookshelf and the smaller bookshelf is our “music shelf” where our songbooks, board games, etc. are. No more stacks of unread magazines sitting on the coffee table. The room is starting to look nice! and eventually, I hope to paint the walls, but that’ll be a future project. I can almost guarantee that you’ll feel better after decluttering your home. I used to take my Sundays and use them for cleaning days. There was so much stuff in the house that by the end of the week, it looked like a tornado went off! We don’t even have children! Since I decided to declutter, I’m able to take just 10 minutes every evening and tidy the house/do dishes. On Sundays, I now just vacuum and do laundry. I went from “tidying” every day for at least 20 minutes AND cleaning for 5-6 hours on Sunday to tidying and cleaning a total of maybe 4 hours a week, and that’s exaggerating. Now, I do understand that if you have children the decluttering task will be much more difficult. 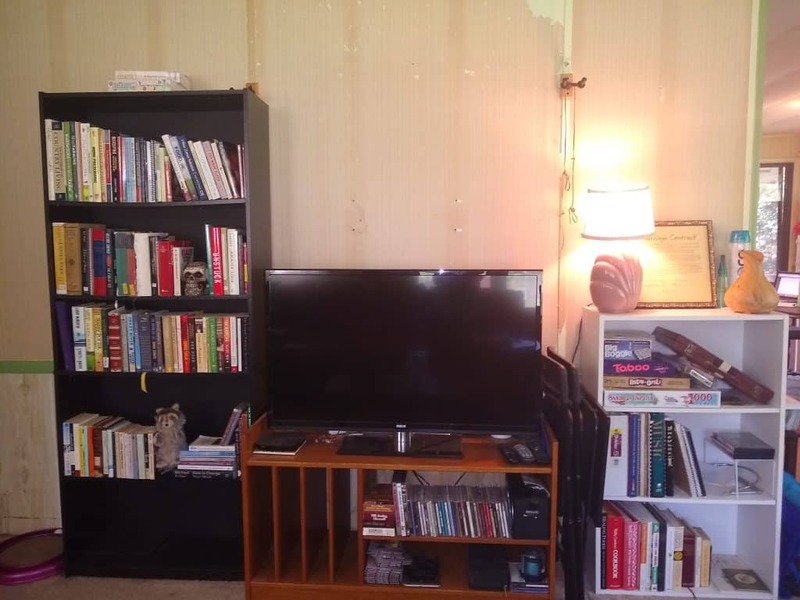 Sit down with your spouse or children if they’re old enough and talk about decluttering. Notice which toys your kids play with the most and remove the others. If they don’t notice after a couple weeks, donate them. Decluttering can be hard, but it’s so worth it. If you have any questions, I’m just a comment away. NOTE: For any pharmaceutical drug or chemical medication, be sure to properly dispose of it. Look up what the right way is, local to your area. BONUS TIP: Some of these pajamas I’ll be repurposing in my sewing room for Christmas gifts! For ways to have a more frugal holiday season, click here! Yes, letting go is terrifying. I’ve been told I don’t have a full-throttle fear of letting go yet because I’m only 25 but I disagree. I just have the certain things that I’m scared to let go of, and the rest are just “things”. With work, it’ll come. There’s no time limit and that’s the beauty of it! Thank you for stopping by, Verbena! I love this, I’m such a declutter person and love organization. Thanks for sharing on To Grandma’s House We Go! I am, too! My husband is the total opposite…I’m trying to convert him! I love To Grandma’s House We Go and have found so much great material. I’ll be back next week! Thanks for stopping by Chas!